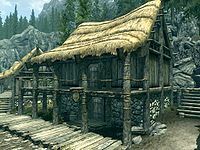 Gray Pine Goods is a small general goods store in Falkreath. The store is run by Solaf, although his brother Bolund, who owns and runs the wood mill, also lives there. It is near the center of Falkreath, opposite Dead Man's Drink and next door to Lod's House. The building has a balcony at the front, which is accessible from the rear via a flight of wooden stairs or from the door on the top floor of the house. Underneath the balcony to the left of the entrance is a food barrel. To the right of the property is another flight of stairs that lead up to the top of a wall that serves as a lookout point for the town guards. Upon entry, Bolund will be in the process of leaving(see bugs). The counter is to the right of the entrance and contains several items. Against the southwest wall is a set of shelves and a cupboard, both of which are filled with food, beverages, and potions. A food barrel is in the western corner and a small coin purse is under the counter. Against the southeast wall is a dresser with a steel sword, an iron mace, and three iron arrows on top. A ceiling rack containing three rabbits, a bunch of frost mirriam, two garlic braids, and two bunches of elves ear hangs above the dresser. Opposite the door on the southeast wall is a fireplace with four pheasants hanging from a rack to the left. Further to the left is a food barrel and a set of shelves containing an iron mace. There is a flight of stairs leading up to the living quarters against the northeast wall with several barrels, a pile of firewood, and an unlocked chest containing minor loot underneath. The following items are sitting out in the store. They can be purchased from the merchant or stolen. Other items may also be present in the store, but those other items are not available for purchase. They respawn after ten days. This is the merchandise found in Gray Pine Goods' Merchant Chest. These items are only available if purchased from the merchant; they cannot be pickpocketed or stolen. They are restocked every two days. 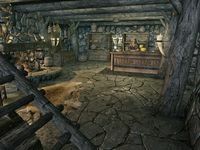 Bolund will only exit Gray Pine Goods if you enter the shop, and therefore will not be found at the mill when entering Falkreath. This page was last modified on 9 June 2018, at 22:56.